Tribal Art is a unique way to add personalization and detail to your helmet, motorcycle, car, boat or race car. We have an extensive collection of tribal art which can be sized and cut to any vinyl color of your choice including reflective and standard colors. Have a look at our Tribal Art catalog and email us for a quote on your selected design. Any size is available up to 30” wide and unlimited length. Some designs are in-stock and others take 24 hours production time. Prices start at $5.00 for up to 6”x6” stock vinyl or $9.00 on reflective vinyl. All items are contour cut meaning only the shape is applied, not the outside or inside waste material. Any size is available. 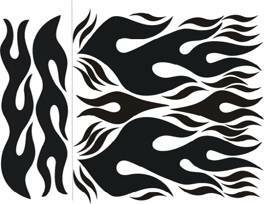 All of our Flame designs include the CUT-OUT areas with additional flame segments for custom designing. All wasted space is filled with other useful designs. Visit Often! We are adding new designs every day! 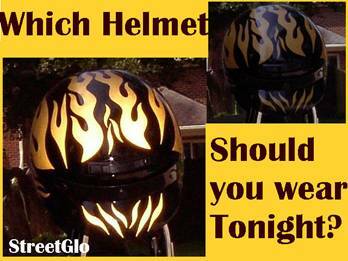 Style and Safety on your Motorcycle: Street-Glo ™ Reflective Helmet Decals are designed for safety with style. You can combine our reflective helmet decals with our Motorcycle Trim Graphic and reflective pin stripe for a truly illuminating experience! Our Reflective Pin Stripe looks like classic pin striping during the day, but blaze with energy at night… StreetGlo can ensure safe night riding in style with our LumaStripe ™ brand reflective products. LumaStripe is ideal for Motorcycle, Auto, Boat, Truck and other applications such as warehousing safety, dangerous container contents, or warehouse floor markings. Make a visual impact! For a visually intense night time ride, consider a full compliment of reflective decals including our reflective motorcycle graphic kit. Got a custom motorcycle graphic kit idea? If we like it, we’ll make it free for you! A great set of motorcycle graphics can make an ordinary bike an exceptional ride! 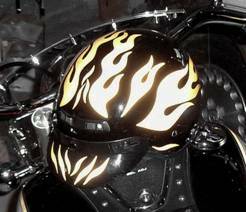 A great combination might include our Mega-Flame reflective helmet decal, Our reflective motorcycle graphic kit and reflective tape (motorcycle pinstripe), and invisible reflective tape (black on black for example) along the bottom of the motorcycle frame. Reflective motorcycle graphics can save your life! Click ENLARGE BIKE to your lower left. We have the cool decals and stickers! We have all the popular custom motorcycle graphic logos too: Harley Davidson Decals, Honda Decals, Yamaha Decals, Kawasaki Decals, Ford Decals, GM Decals, Toyoda Decals, Suzuki Decals, BMW Decals, and more! Large selection of reflective helmet decals: Check out our large selection of ready to ship reflective helmet decals for your Motorcycle or Bicycle. Try reflective vinyl letters on your boat, or replace all graphics on your boat in LumaStripe. We specialize in custom reflective vinyl products for commercial, industrial or municipality applications. If you can’t find what you are looking for, please write today to discuss any design. We have a full compliment of Auto Graphics, Truck Graphics, boat signs / boat names, and a full custom decal department. If you want a custom sticker, we can make a custom sticker for you cheaply and overnight. Got a great custom decal idea? We’ll make it free! We love special projects such as custom sticker and racing sticker decals. We can provide custom vehicle graphics in a flash! Best of all, we use Lumastripe brand vinyl sticker material. We make the brightest reflective helmet decals and reflective motorcycle graphics right here in our own facility. Even custom decals, helmet stickers, or any type of motorcycle graphic looks best in Lumastripe. Those $1 motorcycle stickers should have the same warning as cigarettes! Reflective helmet decals and Reflective Helmet Stickers are more than just cool motorcycle graphics, they are safety items that can save your life! Reflective Helmet Stickers should be used in place of ordinary motorcycle helmet decals on al three sides of your helmet. Those cheap $1 decals often used on helmets do nothing to make sure you are seen at night. Reflective Motorcycle decals should cover at least a 3” x 3” or large section for maximum visibility. LumaStripe reflective vinyl is among the brightest materials available for all reflective helmet decals, motorcycle graphics and typical style biker stickers. We feature Lumastripe in all of our reflective motorcycle graphic products. We are committed to providing the brightest possible material for our reflective helmet decals and graphics. A LumaStripe equipped motorcycle can clearly be seen from well beyond the danger zone. Reflective motorcycle graphics on your helmet and motorcycle are crucial in helping motorist recognize your danger zone. Even in broad daylight, if you shine light upon it, it has a bright sheen unlike any other type of material. It is highly reflective, sharply bright, and at night can be seen, in some cases, over a mile away. If you don’t see it, we just haven’t had time to list it yet! Displayed herein are only a tiny portion of our graphics. We have over 150,000 decal images/ We are busy converting them now for application to Lumastripe products. Please check back often as new decals are introduced daily. Your source for: Reflective Helmet Decals, Motorcycle Decals, Motorcycle Graphics, Car Graphics, Truck Graphics and auto pin striping. 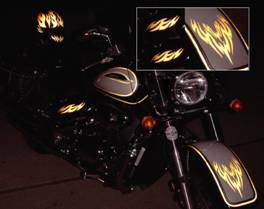 Combine our reflective helmet decals with a motorcycle graphic kit and Reflective Pinstriping ( pin striping ) for a truly illuminating night time experience!. We can supply custom racing graphics and nearly any type of vehicle graphic ever seen on the web or on the street! Replacement factory car logo’s, truck logo’s, and motorcycle logos for Harley Davidson, , Honda, Suzuki, Kawasaki, BMW and More. Car Graphics and Truck Decals, vehicle graphic kits and Custom Vehicle Graphics. Custom Auto Graphics. Streetglo customers strut their stuff with reflective decals. Send us your photos!